Don’t you love this time of year? The snow, the Christmas trees, the hot chocolate, and of course, the endless amounts of Christmas music playing at every supermarket, radio station, and department store. 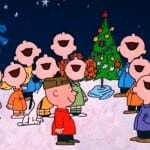 But not all Christmas music is created equal, and while most animated Christmas movies include songs, they may not all be as um… Magical as these songs. I’ve just always found this entire scene fun in A Year Without a Santa Claus. Just because this is so iconic to any Christmas soundtrack. I have always been so impressed by this girl’s voice in The Polar Express. This is such a sweet song in How the Grinch Stole Christmas. No Christmas playlist should be without this song. Because who doesn’t love their dancing and singing snowmen? For some reason, Youtube didn’t have the song from the original claymation film, which is crazy talk because this song is awesome! By now, everyone should know my love of Peanuts, so maybe I have a slight bias, but I think that everyone can admit that this is a beautiful song. In fact, I love all of the music in A Charlie Brown Christmas– Vince Guaraldi is truly amazing. This one may just be the most Christmas-y and sweet song.